A South Carolina woman who said being pulled over for speeding by a “white cop” was a “traumatic experience” is having her story questioned after police body camera footage from the incident showed a less intense series of events unfolding. 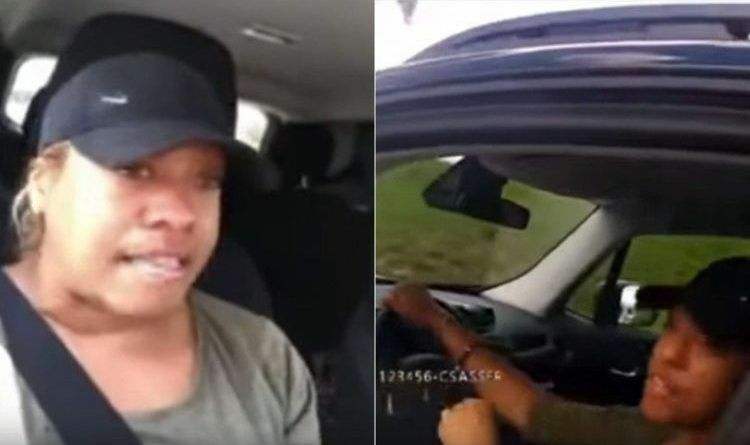 Dawn Hilton-Williams, in a Facebook Live video on April 27, accused a Brunswick County Sheriff’s Office sergeant of racism after she was ordered to sign a summons asking her to appear in court or pre-pay a traffic ticket. The officer said he clocked her going 70 mph in a stretch of rural Route 58 in Virginia that has a 55 mph limit. “It doesn’t matter how polite you are, it’s all sick, crazy bullying and the police are ridiculous,” Hilton-Williams says in the 11-minute video, at times wiping tears from her face and speaking in a frightened tone. After the video was posted, many concerned citizens called the Brunswick County Sheriff’s Office with questions and outrage. This prompted the sheriff’s office to release the full video of the traffic stop, which paints a very different picture than what Hilton-Williams’ describes. Contrary to the woman’s claim, the deputy never threatened to “pull” her out of her car when she refused to sign the summons and there are no references or innuendos to race or racial antipathy. But in video footage released Monday by the sheriff’s office, when confronted with the summons Hilton-Williams immediately starts asking the officer where are their signs that say the area has a 55 mph limit. Still, Hilton-Williams told CBS 6 that she intends to file a complaint against the deputy. Hilton-Williams: It’s a traffic summons. Deputy: Yes, for Brunswick County General District traffic court. Your court date is going to be June the 6th at 10:30 for a 70 in a 55 mile per hour zone. Hilton-Williams: Where is the sign that says it’s 55 mile per hour? Hilton-Williams: Numerous places where? I mean between the gas station I just came from and right here? Deputy: I mean numerous numerous places back that way. You are more than welcome to go back there and look at them, take pictures of them or whatever you want to do. Hilton-Williams: So you didn’t give me a warning? You gave me an actual ticket? Deputy: No warnings today ma’am. Deputy: So your court date will be June the 6th at 10:30 for speeding 70 in a 55. You have the option to prepay this. I’m going to give you a phone number, plus a website that has our courthouse information. If you contact our courts they will tell you what the fine is, answer any one of your questions and if you decide to prepay it, you do not have to come to court. Hilton-Williams: I will not be paying this ticket. Deputy: If you don’t want to prepay it, you’ll have to come to court on June 6th at 10:30. Hilton-Williams: I’ll hire an attorney. Deputy: I need you to sign right here. Hilton-Williams: I’m not going to sign that ticket. Hilton-Williams: I don’t have to sign it. Hilton-Williams: But I appreciate it. Hilton-Williams: My cousin is on the phone. Deputy: I don’t care about that. I don’t care who’s on the phone. I’m talking to you right now. You do not have a choice but to sign summons. See thank you. I knew you was gonna sign it. I appreciate it very much and you have a safe day. Okay, thank you. Share tnis news everywhere because the MSM will like to create another fake scandal!